Children with metabolic bone disease commonly come to the neurosurgeon with the underlying disease already diagnosed. If a child presents de novo to the neurosurgeon with conditions such as basilar invagination, spinal instability, or spinal stenosis, then the possibility of such an underlying metabolic disorder should be explored in conjunction with specialists in radiology and genetics. Macrocephaly: In achondroplasia the clinical appearance is characterized by a large head, with a frontal prominence, a narrow trunk, and short limbs. Large head size is thought to be due to chronic elevation of ICP secondary to cranial venous outflow obstruction (37). Thanatophoric dysplasia is associated with an enlarged head with widely positioned eyes, but it usually is not compatible with survival and will not be discussed further. Ventriculomegaly: Mild to moderate ventriculomegaly is common in achondroplasia, although it usually is not progressive. Progressive ventricular enlargement or symptoms of elevated ICP requiring shunt placement occur in less than 5% of cases (17, 22), although a shunt placement rate of up to 20% is described in some contemporary series (31). The phenotype is much milder in hypochondroplasia. Coarse facial features: Patients with mucopolysaccharidoses, in particular those with Hurler and Hunter syndromes, typically have coarse facial features and also may develop hydrocephalus. Motor regression: A new onset weakness and clumsiness with poor fine motor control are common symptoms of high cervical myelopathy but may not be manifest until late in the evolution of cervicomedullary compression. Reduced exercise tolerance and a tendency for repeated falls are common. In many of the metabolic bone disorders short stature, generalized bone deformity, and systemic involvement are inherent components of the disease, and thus motor evaluation may be difficult. Pain: Headache or pain in the suboccipital region, sometimes diagnosed as “basilar migraine,” commonly exists where there is tight stenosis at the foramen magnum or significant craniovertebral instability. Hindbrain herniation may develop secondarily, resulting in a headache typical of Chiari malformation. Where there is basilar invagination, distortion of the brainstem may cause pain in the distribution of the fifth cranial nerve. Bulbar dysfunction: This is usually a feature of basilar invagination (as seen with osteogenesis imperfecta or Hajdu-Cheney syndrome), and symptoms tend to occur late in the evolution of the disease when there is major brainstem distortion. The most common brainstem symptoms associated with basilar invagination are nystagmus, ataxia, dysphagia, and facial numbness (16, 29). 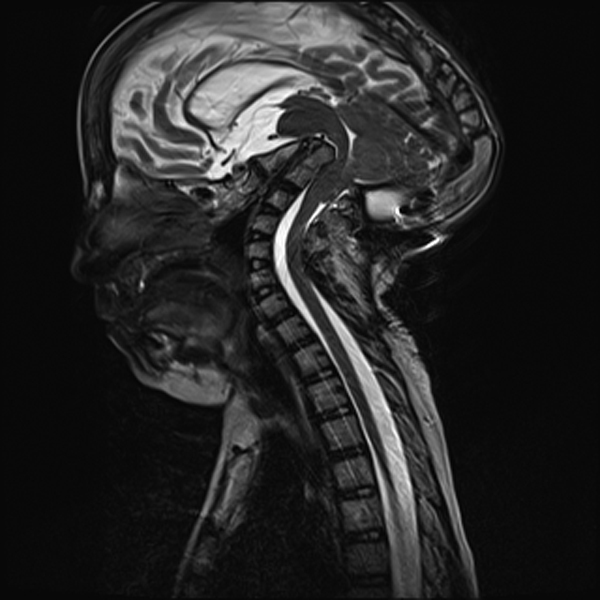 T2-weighted Sagittal MRI of severe basilar invagination: This image is of a child with Hajdu-Cheney syndrome. Seen is severe brainstem distortion due to the basilar invagination. Torticollis and limited cervical spine mobility: These conditions may occur either as a direct result of compression at the cervicomedullary junction or where there is abnormal segmentation at the craniovertebral junction. The biomechanical consequences of metabolic bone disorders are reflected in the spine at potentially all levels, although the vulnerability of particular sites depends on the underlying condition. Symptoms depend on the site and nature of the underlying spinal anomaly. Mid-cervical kyphosis: Reversal of the normal cervical lordosis, resulting in progressive kyphotic deformity, is seen in the disorders of ligamentous laxity, e.g., Larsen syndrome (24). Affected children have generalized muscle weakness and joint involvement as part of the underlying condition. The spinal deformity may be asymptomatic but can lead to neck pain and myelopathy. Spinal canal stenosis: Narrowing of the spinal canal is typically a feature of achondroplasia and reflects short pedicles along the length of the spine. Neurogenic spinal claudication is present in 90% of patients undergoing surgery. Bladder and bowel symptoms reflecting cauda equina compression are present in up to 25% of patients (31). Spinal canal stenosis progresses over time. Decompression is unusual in the first decade of life, but by the sixth decade 80% of patients with achondroplasia will have symptomatic stenosis. The thoraco-lumbar junction and lumbar spinal canal are most commonly involved; together they account for more than 80% of spinal decompressions. Cervical spinal stenosis is also seen in patients with Hurler and Hunter syndromes, where it is due to ligamentous infiltration by glycosaminoglycans. Thoraco-lumbar kyphosis: Spinal deformity affecting the thoraco-lumbar junction is a feature of Morquio syndrome and achondroplasia. Slow evolution: Most commonly, symptoms evolve insidiously, sometimes over months or years. Acute spinal cord injury: On occasion, particularly where there is marked stenosis or severe hypermobility, relatively mild trauma my precipitate sudden deterioration (5). In the presence of symptoms or clinical signs of concern, investigations and specialist consultations should be arranged. Imaging: Radiological evaluations may include a combination of plain x-rays, CT scan, or MRI. Plain x-rays of cervical spine in flexion and extension are needed to assess stability. CT scan is used to assess complex bone anatomy (particularly in the presence of deformity) and suitability or instrumentation. MRI is required to evaluate the impact of vertebral anomalies on the neuraxis. Consultations: Consultations include physical therapy and metabolic medicine. Additional input from pulmonology may be indicated as many bone dysplasias are associated with restrictive pulmonary dysfunction (e.g., Morquio syndrome and spondyloepiphyseal dysplasia). Surgical team: Liaison with anesthesia is essential given the propensity for comorbidities in affected children. The requirements of electrophysiological monitoring are discussed. Discussion and planning with spinal orthopedics is often indicated where there are specific instrumentation needs. In the event of emergent presentation, severe myelopathy, or evidence of instability, investigations should be expedited. Immobilization: Initial immobilization in a halo-body orthotic maybe appropriate in instances of hypermobility or instability. The advantages of using a halo-body orthotic are that optimal reduction of cervical deformity can be achieved, the risk of ongoing damage to the neuraxis is reduced, patient positioning under anesthetic at the time of the definitive surgery is safer because excessive intraoperative movements are reduced, and immobilization can be continued into the postoperative period when needed. Positioning and activity: Children with bone dysplasias frequently have significant physical disability. Unless there have been recent neurological symptoms or increasing spinal pain, no additional restrictions on activity are imposed preoperatively. Vital signs: In addition to blood pressure and pulse measurement, overnight oximetry is useful to assess a baseline prior to surgery. Orthoses: For children with progressive thoracolumbar deformity a spinal brace may be indicated. A brace can slow the rate of progression of deformity, improve pain control, and provide additional support and immobilization postoperatively (23).